Of course Heinrich Schütz was born in the late sixteenth century and died 87 years later in the seventeenth: 1585–1672, to be precise. But the Schütz familiar from our standard history books is very much a twentieth-century creature. After all, it was only in the 1920s and 30s that Schütz’s music became fully “domesticated” among amateurs and musicologists (who found each other in the Singbewegung—the “movement” that sought to encourage a rebirth of German culture through group singing), attaining a popularity that his elitist output had never seen during his lifetime. And contrary to the nineteenth-century vision of Schütz as a consummate musical dramatist, the early twentieth-century liturgical renewal movement produced the enduring image of the composer as a Lutheran preacher figure. His appropriation into the Weimar-era Hausmusik scene and his supposed exclusive dedication to Luther’s Word both allowed Schütz’s music to be distanced from conventional concert culture and any “merely” aesthetic appreciation of his works. The Neue Schütz-Gesellschaft, established in 1930 to replace a defunct earlier organization, eagerly embraced this liturgical agenda, and the journal Musik und Kirche, founded the year before, quickly became a leading forum for Schütz scholarship and advocacy. The fact that no instrumental music by Schütz survived was taken as further proof of his sole concern for Lutheran dogma; his secular works, on the other hand, faded into the background as a necessary evil brought about by his court employment. The determination with which Schütz was refashioned into a musical herald of Lutheranism far exceeded the similar treatment accorded to his Protestant heir Johann Sebastian Bach, whose music was by this time too firmly established in secular concert life. The conspicuous lack of chorale settings in Schütz’s output compared with Bach (a total of about 40 melodies or fragments in an œuvre of over 500 items) was breezily overlooked; so too was the fact that prominent collections such as his Psalmen Davids (1619) contained large-scale pieces whose stately splendor patently did not mesh with the Protestant cantor fiction. Critics summarily dismissed these works as focused on mere sensuous beauty and grandeur of sound—though the Nazis subsequently came to appreciate those same characteristics, allowing them to claim Schütz as a monumental Northern German hero while playing down any unwelcome religious content. The Lutheran-preacher image instead worked best for few-voiced works such as the Kleine geistliche Konzerte (1636, 1639) or the Geistliche Chormusik (1648). It was further consolidated in the 1940s by the “discovery” of musical rhetoric, in particular the so-called “doctrine of figures,” which seemed to provide a key to understand meaning in Schütz’s music. In offering an apparently historical foundation for the notion of Schütz as scriptural interpreter, rhetoric became an almost compulsory preoccupation for post-war scholars. As an analytical method, it allowed them to explicate and thereby valorize a repertoire whose structures resisted standard categorization. Moreover, the topic of rhetoric could give the appearance of a relatively neutral ideology, even if the idea of Schütz as musical orator remained closely bound up with claims about his national identity and special affinity with the German language. All this is not to suggest that text painting never played a role in Schütz’s choice of musical gestures. To take a single example, in the motet “Ich bin eine rufende Stimme” (SWV 383), a setting of Mark 1:3 from the Geistliche Chormusik, the melismas from m. 29 might well illustrate the word “Weg” (path), as rough and bumpy as the melodic contour. But such a reading only considers the shape of individual lines, while missing the broader process of intensification created by their successive combination (first three, then six “bumping along” together), and the later fracturing of the motive into breathless reiterations (e. g., in the alto from m. 38). Focusing on the treatment of a single word thus inhibits any sense of enjoyment from the gradual amplification of sound, from the virtuosity of the outburst, or from the rhythmic excitement after the placid preceding section. Moreover, the subsequent passage in the piece presents a varied version of its opening point of imitation, now underlaid with a different text—a striking double-exposition design that again makes most sense on a musical rather than a textual level. A closer look at the theoretical sources of Schütz’s time—the celebrated musica poetica treatises of Joachim Burmeister and others—reveals that, contrary to the later near-exclusive concern with textual interpretation, these theorists indeed understood rhetoric primarily as a set of syntactic strategies for varying and amplifying musical ideas. The rhetorical terminology allowed them to categorize common procedures of musical design: the very first figure listed by Burmeister, “fuga realis,” simply described an imitative combination of subjects, of the sort used by Schütz for that exposition in SWV 383. Rhetorical labels hence performed an important role in conceptualizing techniques of phrase arrangement, but were not intrinsically tied to textual meaning. But the fallacy of this “doctrine of figures” as an interpretive system still underpins current perceptions of Schütz’s music as primarily a word-centered, sermonic art form. And yet, even if the Lutheran-orator image can be thus discredited, we perhaps find ourselves no closer than those early twentieth-century critics to knowing what to do with a figure like Schütz. As musical canons continue to broaden and dissolve, his contributions may teeter ever closer to the edge of oblivion, making him an unlikely candidate for widespread musicological attention in years to come. One answer—if indeed we need one—might lie in recovering precisely that dimension of sounding beauty that Schütz and his listeners were so much more attuned to than our historical narratives have tended to assume. If nothing else, such a shift in perspective may allow us to envisage a more plausible, twenty-first-century version of the man and his sound world. Bettina Varwig is Senior Lecturer in Music at King’s College London. 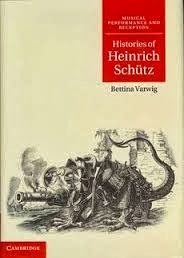 Her book Histories of Heinrich Schütz was published by Cambridge University Press in 2011.